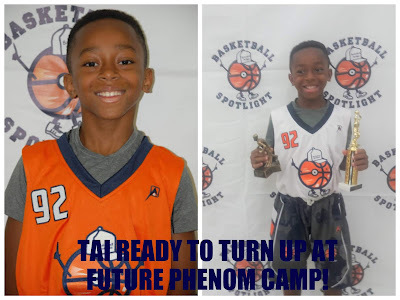 BASKETBALL SPOTLIGHT NEWS: Tai "Turn Up" Returns To Future Phenom Camp! The loaded Class of 2025 just added another top guard as Tai “Turn Up” Turnage as confirmed his return to the Future Phenom Camp. As you may remember Tai made a huge splash last summer at the Future Phenom Camp finishing ranked #3 overall in his class and making an appearance in the AGame All American Game. The Big Apple floor general is definitely worth the price of admissions and will be looking to solidify himself as the top rising 6th Grade guard in America. Stay tuned as Basketball Spotlight brings you more top players that will be headed to Future Phenom Camp.